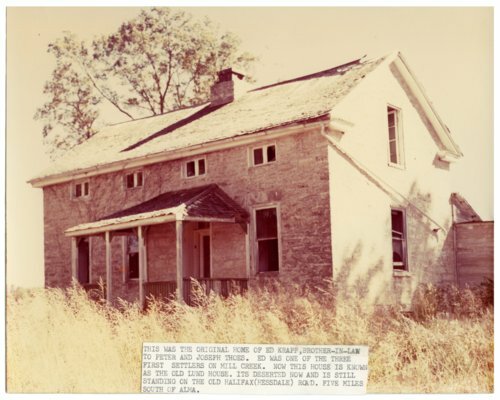 Photograph showing the homestead of Ed Krapp in Alma, Kansas. The attached caption reads, "This was the original home of Ed Krapp, brother-in-law to Peter and Joseph Thoes. Ed was one of the three first settlers on Mill Creek. Now this house is known as the old Lund house. It's deserted now and is still standing on the old Halifax (Hessdale) Road, five miles south of Alma."